Acorn Hill Academy: Look what I found! Today, since we finally have some sunshine, I was outside trimming some bushes. It's probably not the right time, but they have been ignored for a long time (since before we moved in a year ago - eek) and some of them are out of control. Actually, Abbie did a lot of the trimming for me last week, but she didn't do the Giant Holly Bush or the Rose Bush Trying to Take Over the World (RBTTOW). It's a cardinal's nest! Of course, I immediately stopped trimming the bush and cleaned up, to get away from there as quickly as possible. That poor mother bird must have been having heart palpitations. The RBTTOW looks a little, shall we say, interesting at this point, half trimmed, but I'd rather have the baby cardinals. 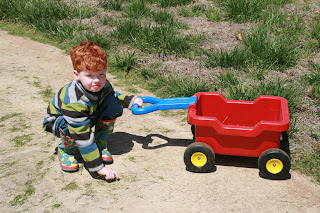 Isaac was very helpful yesterday. 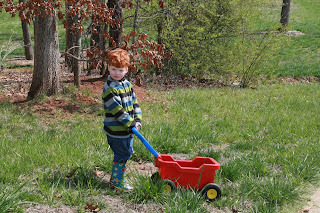 He picked up branches for me in his little red wagon, and dumped them on the edge of the yard - almost in the "natural area." He also used his wagon to clean up after the lawn mower. He is so cute sometimes, I can hardly stand it. 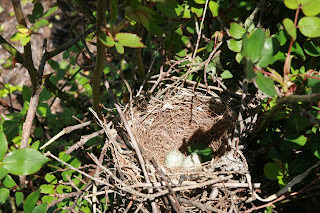 Update: The mother cardinal was back on her nest this morning when we came home from church! I'm hoping to get some pictures of the babies as they grow.